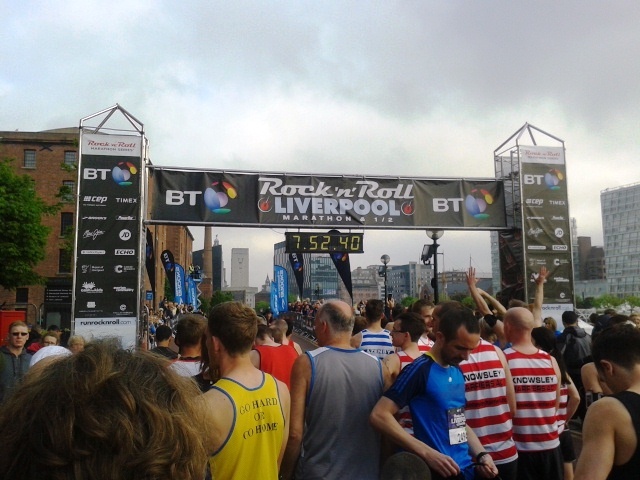 After the hilly delights of the Rock ‘n’ Roll Madrid half marathon we were back on the trail for more chunky medals at the inaugural Rock ‘n’ Roll Liverpool Half Marathon. The clever marketing and ideas people at the Rock ‘n’ Roll Series had lured us in with the offer of an extra Heavy Medal for finishing two races in one year. Our first UK race for a while and it was nice not to have to jump on a plane – just hop in the car and 3-4 hours later we would be there. Unfortunately it didn’t turn out like that as we set off later than planned and didn’t arrive at our B’n’B until after 4 pm on the Saturday. A combination of traffic jams and traffic management signs dragged us through a 7 hour journey. I see now why we do not do many UK runs; if you’re not stuck in traffic you get ripped off on train prices. With no Expo to attend due to our race numbers arriving in the week, this freed up some time to head into the Albert Docks for our very first Tweet Up with fellow RnR Liverpool runners @RunJPR, @claireramsden, @josteelrun, @julierarity and @vickiemmamurphy for a few orange and lemonades. Chatting about all that is running, knowing you’re not boring anyone was a nice change. Normally when I waffle on about races, friends’ eyes glaze over. The following day, it was an 8 am start for the half marathon and 9 am for the full. Prepped and ready we jumped on the train to James Street, about an 8 minute walk from the Albert Docks start line. 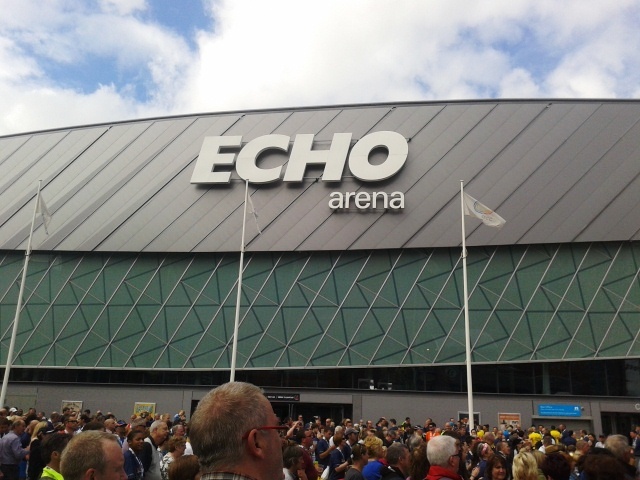 Baggage drop-off, in the Liverpool Echo arena, was easy to find and very straight forward, as was finding the starting area which snaked along the dock front parallel to the main road. I was up in corral one, the closest I had ever been to the start line. I was, for this five minutes before the start, a professional athlete! The atmosphere in the crowd was fun and buzzing – a great starting area. With the local radio station to my left, Austin Healy, ex-England rugby union legend, started the race and I crossed the line in about 15 seconds. Minimal support was out as we headed off, with the odd man and his dog and fellow runners walking to the starting area for the full marathon. I wasn’t too surprised about this, it being a gloomy Sunday morning in a party city. Away running though the streets, hitting a few slight inclines early on and going at a pace too fast for my liking, I refocused and admitted to myself that just because I started in the first corral I was not going to win this race. The streets became nondescript after a while and with no real course atmosphere my focus started to drift and I was wanting to call it a day and jump on a bus back to the B’n’B. There was the odd band on the course but I found the majority were just setting up, tuning, testing microphones etc in preparation for the full marathoners. I felt we, the half marathoners, were just a warm up act. After several kilometres the course took us into Sefton Park. With varying inclines and continuing non-support this was a mind over matter stage of the race for me – a case of getting the race done as soon as possible. However, with my Garmin again failing to lock in the GPS on the start line I was running free with no clue on my pace and only a rough idea of a possible finishing time. In and out of the park onto the streets again and through subways, this course was very different to any I had run before and at times it felt like a Sunday morning training run. Water stations were every 3 – 5km and the distance markers wherever you could see them. Switching from kilometres to miles now and again was not ideal, jumping from 5km, 10km then to a 10 mile sign. Coming to 19 km the course brought us down to the waterfront of the River Mersey and with the ferris wheel in sight I knew I was nearly there. The last few kilometres along the Mersey, with not much support, was done on pure determination to finish and get those two medals. Getting increasingly tired, bored and still not feeling any enjoyment I could not wait for it to be over and subsequently passed by many runners in the closing stages. For some reason I didn’t care. Coming into the finishing area in the Albert Docks support was good, with both sides of the road filled with cheering people. This gave me one final push to cross the line under the 1:40 minute mark and achieve a PB. Race done in a time of 1:37, beating my previous best by 4 mins done at RnR Madrid the month before, and I had my second and more chunkier RnR medal around my neck, collected from inside the Echo Arena. Outside the arena in a square the opening band kicked off a mini music festival. However, before I could settle down I had to pick up the important heavy rocker medal and I soon had two medals clinking around my neck. I was quite pleased with my achievement (some stats below) even though it was one of the most unenthusiastic races I had run for some reason – possibly due to tiredness from the drive and lack of support along the course. Organisation however was once again faultless by the Rock ‘n’ Roll Series. Bags and medals adorned I wandered back to the finish area to look out for Ro who finished with a 2:11 PB, smashing her previous by 13 mins, and then it was back to the music where we listened to some old classics from The Christians among hundreds of fellow other runners. It was a great way to finish a busy 24 hours and put a smile back on my face.